Mint Julep gain insights into their shoppers’ behavior to both improve engagement and impact revenues. How can Mint Julep gain insights into their shopper’s behavior to both improve engagement and impact revenues. How can Mint Julep ensure their shoppers feel appreciated and rewards especially their VIPs. How can Mint Julep differentiate itself from other Lilly Pullizer sales channels to ensure repeat purchases at its location. A long-time Retail Pro client, Mint Julep, is Atlanta’s Lilly Pulitzer Signature Store located in the Peachtree Battle shopping center. Mint Julep houses the entire Lilly Pulitzer brand under one roof and also offers other chic resort wear lines, a must-have destination stop for ladies prior to heading out on a sun-filled vacation. The Lilly Pulitzer’s lifestyle brand is thriving through these amazing signature stores, inspiring new generations to be unique, embrace a vibrant life full of color, follow our passions and have the courage to be an entrepreneurial trend setter. Focus on shopper insights, appreciation, and differentiation. Although the Lilly Pulitzer legacy is strong, and in and of itself creates a good amount of brand loyalty, the owners of Mint Julep knew they needed a modern solution to address their store level challenges and aspirations. How can Mint Julep gain insights into their shoppers’ behaviors to both improve engagement and impact revenues? How can Mint Julep ensure their shoppers feel appreciated and rewarded, especially their VIPs? How can Mint Julep differentiate itself from other Lilly Pulitzer sales channels to ensure repeat purchase at their location? The owners decided early on that they wanted to be able to find and implement a solution that helped them with all these goals but there was one key that was equally important. The solution needed to be operationally efficient and not have a dramatic impact on their business processes, especially at the Point of Sale. Mint Julep consulted their decade long Retail Pro Business Partner, Retail Technology Centers (R-Tech®) for advice on how to find a technology and service partner that might be able to help them meet all of these goals. Based on their trusted vendor’s advice, they decided to take a close look at AppCard for Retail Pro. The management team was excited to see that AppCard was completely integrated into their Retail Pro Point of Sale, which was a key factor in their decision. The ability to reward and redeem in real-time through an integrated POS solution requiring minimal impact to the sales transaction was exactly what they were looking for. Another key requirement was to be able to have a flexible platform that could enable them to create a loyalty program that was an exclusive membership, as their top priority was to specifically reward their most loyal customers. AppCard created the “Mint Julep Loyalty Club” which was an easy to understand Cash Back program that would encourage participation, keep club members engaged, and ensure those in the Club felt appreciated for their repeat business. Mint Julep faces many of the same challenges other brick & mortar stores face, especially when there are other channels to buy the same product on-line or in other retail stores. Even with their exceptional customer service and attention to detail, Mint Julep’s owners needed a tool to help them to differentiate themselves through both rewarding their loyal shoppers and leveraging their in-store data to market in a more personalized way. AppCard was the only solution that could offer them this entire suite of services and technology. Now, with a click of the mouse, management can quickly see top products sold, cashier rankings, run product mix reports to better understand which products are sold together most frequently, and segment their customers based on Recency, Frequency, and Monetary Spend. 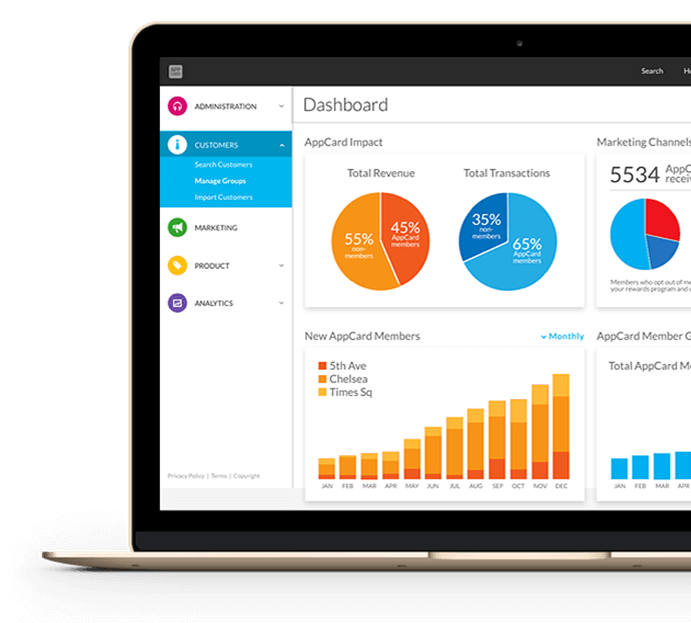 In fact, AppCard delivers over 100 reports to Retail Pro merchants looking to make sense of sales data and especially shopper behaviors. The data is the fuel behind the AppCard engine and Mint Julep is just starting to uncover the power of being able to reach back out to their shoppers with targeted and personalized campaigns. Nico, Mint Julep’s AppCard account manager, helps her client to decide on new ways to proactively engage Mint Julep Loyalty Club members and she even executes those marketing campaigns which can be delivered through a variety of channels: SMS, App, Automated SMS, and Email. In keeping with how Lilly Pulitzer herself would have wanted to be treated, as a unique individual, Mint Julep’s shoppers are sophisticated with discerning tastes and looking for personalized treatment. The results thus far, show compelling statistics when we analyze the AppCard vs Non-AppCard member results. In 2015, Mint Julep Loyalty Club members spent an average of 34.66% more than non-members and had an average of 29.65% more products purchased per transaction. In addition, the owners can already see that the number of loyalty shopper visits has increased with a corresponding decrease in the timeframe between those visits. Engaging their top shoppers was of the highest priority and Mint Julep’s owners are very pleased to see such a positive response from their VIP shoppers to both their 5% cash back program and AppCard enabling them to track their own rewards. The owners of Mint Julep are most excited about the wealth of data they get through the customer reports within AppCard’s cloud-based reporting suite. It is easy to segment their customers, see all their sales, and modify customer details and rewards, all with the goal of enhancing the customer experience and impacting profits. The next step for Mint Julep is to make even more use of their growing database by creating more personalized campaigns, communicating at the shoppers’ preferred touchpoint and using the AppCard insights to take actions that directly impact the bottom line. They have already started to communicate to Club members via SMS campaigns and are working with their AppCard Account Manager on the next wave of marketing activities.